Endangered species in the Indian Ocean may not be seen as a concern by many people. Indian Ocean covers about 20% of the ocean water in the world and by this kind of percentage we knew that a lot of species of marine animal live there. But then just because this some species of endangered species still exist and some of them are wild doesn’t mean that we still can ignore them. If some of this endangered species is extinct it will distract and make the ecosystem unbalance. An unbalance ecosystem for sure will distract and affect our life too. Maybe some of you don’t know about these species of animal that is endangered and located in the Indian Ocean. And here’s I’d like to share you with about some species that is endangered in the Indian Ocean. 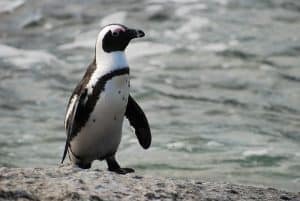 First of all we have African Penguin as the first endangered species in the Indian Ocean. This species of penguin is also has another name that people known such as jackass penguin and black footed penguin. It is the only species of penguin in the Africa. If you want to find this rare penguin in Africa you can start by looking for them in the rocky habitat. African penguin feeds on fish, squid, and crustaceans. 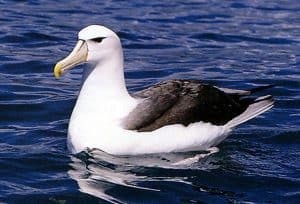 Albatross is classified as a carnivore bird that can be found in the salt water area. This species of bird feeds on crab, fish, and squid. Its size from its head to tail can reach the number of 1.2 m with its wing span up to 3.4 m with its speed to fly up to 64 kph. It can live up to 40 years. There are about 22 different species of albatross that is recognized by IUCN. This species of tortoise can be found around the swamps and also grasslands. It can grow and reach its body length up to 1.2 m with its weight up to 250 kg. 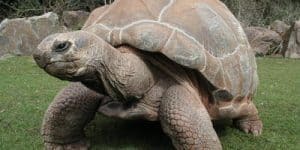 Because aldabra giant tortoise is herbivore, it feeds on grasses, leave, and flower. About its life span, it can reach the number of 255 years long. 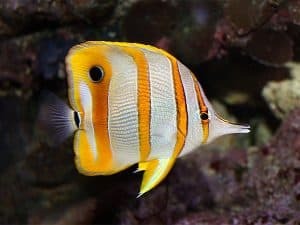 Angelfish has a lot of color and pattern because they are also came from different species. 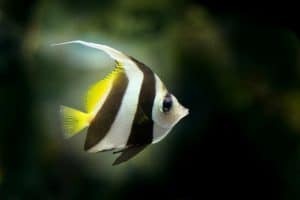 Even though angelfish is classified as a small fish its life span can reach the number of 15 years. You can find them around the coral reef because they feed on alage besides fish and plankton. Blue whale is the largest animal in the world. It can reach its body length up to 30 m with its weight up to 160 tonnes. 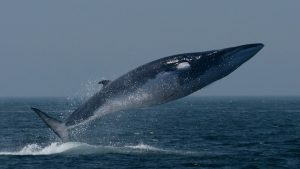 About its life span, blue whale has a life span between 30 to 45 years. 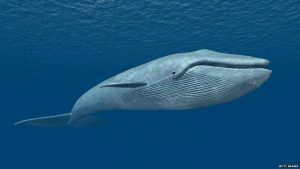 Even though its body is so big, blue whale doesn’t feed on big fish. About its diet, it feeds on krill, plankton, and small fish. Cuttlefish has a short life and its live only last for three years. Even if so, cuttlefish is classified as carnivore and it feeds on crab. Its body size can reach the number of 50 cm in length and 10.5 kg in weight. 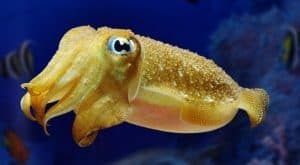 There are some animals that feed on cuttlefish such as fish, shark, and another species of cuttlefish. 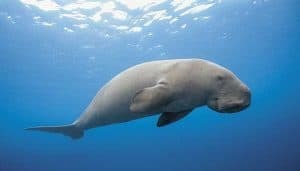 Dugong is one of the marine mammals that feeds primarily on seagrasses. Their habitat are in the seagrasses forest and tropical area where it has warm water for the dugong habitat. There are also some predators that feed on dugong such as shark, crocodile, and human. About its life span, dugong can live up to 70 years. Edit After the blue whale, fin whale is the second largest mammal in the world. Its body size can reach the number of 24 m in length and 70 tonnes in weight. Their life span can reach the number or 7 years long. Just like any other whale, this species of whale also feeds on krill, small fish, and crustaceans. Giant clam is one of the clam species that can live up to 100 years. It is called giant because its size can reach the number of 1.2 m in length and 200 kg in weight. This giant clam is feeds on algae, phytoplankton, and another nutrient in the ocean water. 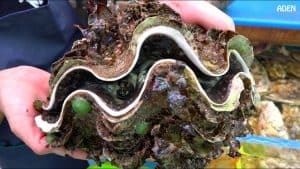 Even though the size is giant but there are still exist some predators that feed on giant clam such as eels, snail, and starfish. 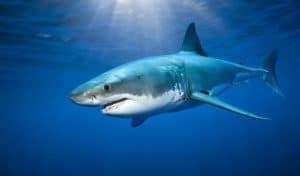 Great white shark is one species of shark that scared many people. This species of shark can grow and reach its body length up to 7 m long with its weight up to 2240 kg. It loves to stay in a group and haunt together and its life span can reach the number of 40 years. There are some preys of great giant shark such as fish, seal, and dolphin. Its ability to dive can reach the depth up to 1200 m with the speed up to 56 km/h. Maybe there is only a few people knowing about the grey reef shark and I’d like to inform you more about it. 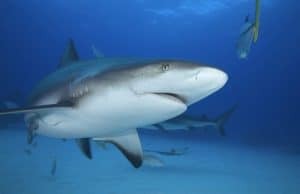 Grey reef shark is a species of shark that exist in the warm ocean water area and like to be around the coral ref. This species of shark feeds on fish, squid, and crab. About its body size, its body can grow and reach the number of 2 m in length and 30 kg in weight. Manta ray can be classified as the large flattened fish. That is because its size can reach the number of 9 m in length and manta ray can live up to 20 years. It feeds on fish, plankton, and shrimp. 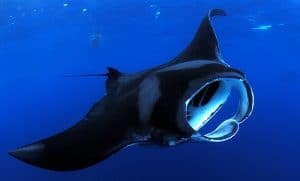 There are also some predators that feed on manta ray such as shark, killer whale, and also human. This species of ray can travel for the distance about 1000 km and they can dive for the depth up to 1000 m.
Next up, we have zebra shark on the list of endangered species in the Indian Ocean. 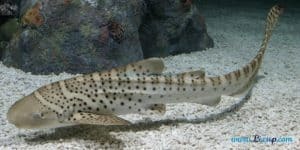 Zebra shark can grow and reach its length up to 2.5 m with its weight up to 20 kg in weight. If you want to find this species of shark, you can just go to the coastal area in the warm ocean water area such as in the Indian Ocean. This species of shark is feeds on fish, crab, and snail. Spiny dogfish can be found in the bays and the inshore water. Its body length can reach the number of 1.6 m in length and its life span can reach the number of 80 years. This species of spiny dogfish primarily feeds on fish, squid, and also crustaceans. Just like any other animal, this species of fish also has some predators such as shark, whales, and human. This is the end for our today’s article and thank you for being our loyal follower that always follow the newest update of our article. Hopefully what we serve to you can help you to understand more and expanding your knowledge about the deep ocean. Thank you so much for reading endangered species in the Indian Ocean. This means you have a high concern for the ocean environment.